What a difference two hours can make. At 10:30 last night—after scant sleep the night before and a couple of glasses of wine with good friends at dinner—I shut down the house for the night and thankfully climbed into bed. No detectors or monitors were beeping, but I flipped on a few lights to check for smoke. When I got to the stairwell the smell was truly sickening, and I did venture down one floor to look around. But then, like any self-respecting, intelligent, independent-minded, problem-solving women’s libber would do: I went to wake my husband. I do feel kind of bad about that. He’s had a bad cold for a month and is now on antibiotics for a sinus infection, and while I’d only gotten three hours sleep the night before from his persistent cough, he hasn’t had more than three hours straight for more than a week. And I wasn’t even so sure he could help, even without his nose so compromised—I’m often sensitive to smells he never perceives. So when I woke him, and he immediately said, “What’s that awful smell,” I knew we had a problem. We spent the next hour looking everywhere. But the smell was so pervasive by that point, and our respiratory tracts so raw, we could no longer tell where it was strongest. Dave, a retired safety man for a gas utility, suggested we call 911. I, who have not surrendered my preference for denial in the absence of empirical proof , argued against it. We sat with our non-emergency, dumb with lack of sleep, propped up by adrenaline, afraid to go to bed for fear we would never wake. At 1:30 a.m. Dave finally made the call. The operator told us to wait outside our home. Within ten minutes a bunch of first responder SUVs arrived, lights flashing, along with the fire chief and assistant fire chief. Two big fire trucks we’d heard scream through town had parked outside our address and lit up our row of town homes like it was daytime. Eventually we entertained almost a dozen fully outfitted firefighters with oxygen tanks on their backs—roughly the same number of writers who had attended my afternoon workshop just twelve hours before. Their procedure is to set an orange cone at the bottom of the steps and hook it onto the railing—each firefighter wears two tags on their gear, and when they enter a building they clip one of them to the cone so if someone doesn’t make it out, the others can figure out who’s missing. 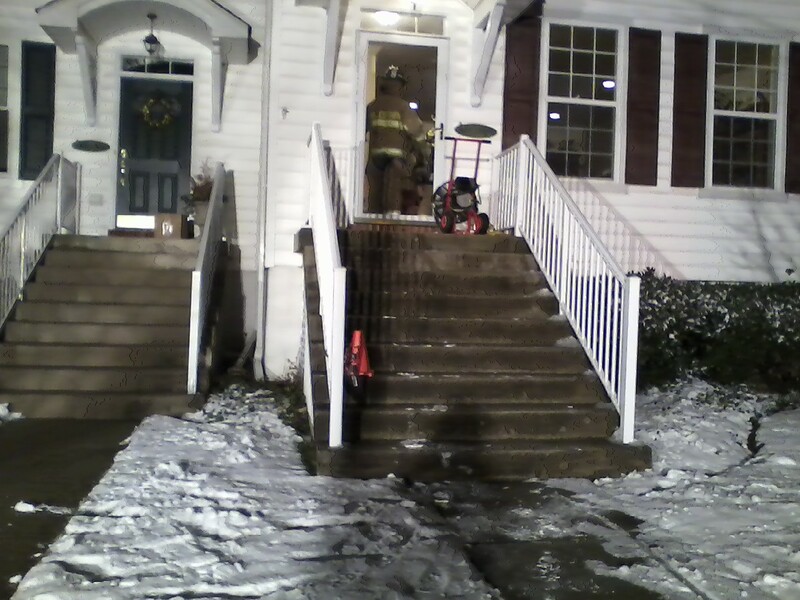 As each of the firefighters tried in vain to wipe the snow from their boots before entering the house, I thought of the writers who had arrived that day in the snowstorm and asked if they should remove their shoes to save our pale carpets. Now, I just wanted to save our house. The firemen searched the whole house, as we had. Using thermal imaging devices to look for hot spots behind walls and in other spaces unavailable to the naked eye, they double-checked their work inside and out, including the outsides of our neighbor’s houses. They tested the air inside for toxins. Every now and then they came outside so they could return to their search with a fresh olfactory perspective. But one thing impressed me: All of them took this quite seriously. Better safe than sorry, they said. I recalled seeing a piece on TV where Gavin de Becker, the author of The Gift of Fear, said that most of us know when danger is present—then talk ourselves out of it. In his book he urges us to trust our gut instincts, and I’m glad we (ultimately) did. One of the firefighters told us how detrimental such denial can be: one homeowner called 911 only after their carbon monoxide monitor had been going off for five hours. The purpose of their call was to see how on earth to turn it off. 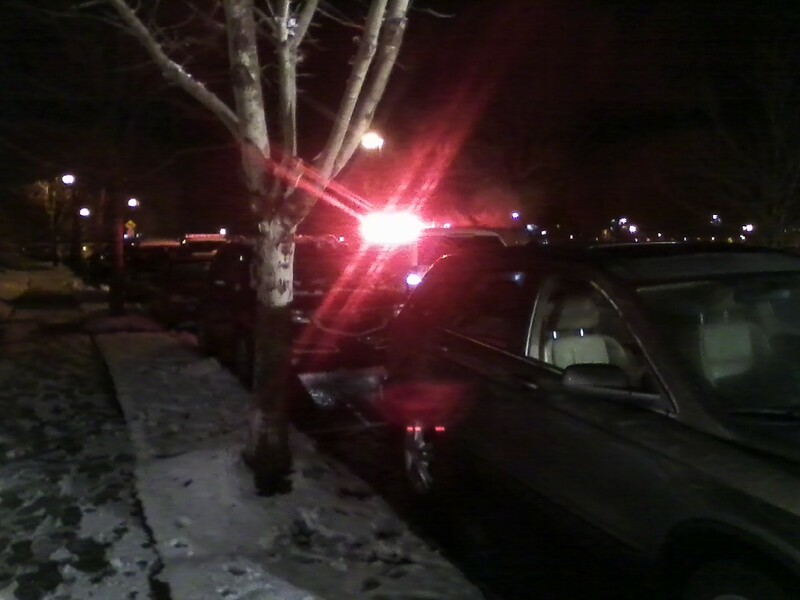 The cause of the harsh scent, the firefighters finally came to believe: our refrigerator. They unplugged it and pulled off a back panel to look for fire, which they did not find, but once it had been unplugged for a half hour the smell started to dissipate. Their theory was that something inside of it has burned out. In the first photo above, sitting at the top of the stairs, is a fan they’d brought along, but when the air tested safe they packed it back up and left without using it. Sleep cycle now hopelessly skewed, Dave was wide awake by this point so stayed up to watch on TV a live Grand Prix race he had planned to watch taped today. I couldn’t get to sleep because my feet were so icy from standing out in the snow for an hour so I microwaved a sock full of rice and tucked it into the bottom of the bed to warm them. Then, after cracking the bedroom window for good measure, I eventually was able to catch a few hours of sleep. As for our stainless steel side-by-side, it’s one of the few aspects of our home we never liked anyway. It doesn’t work wedged into a corner as it is, because we can’t open the door wide enough to get into it without a fair bit of contortion. We’ve chosen to fridge shop rather than see about repairing it. Anyone interested in the old fridge let me know within a couple of days—but consider yourself forewarned! Have you ever chosen denial over gut instinct—and regretted it? I’d love to hear your story. I am so glad everything turned out okay! I have an overabundance of the gift of fear (anxiety disorder) so I often have to ignore my gut instinct in order to function. It is very uncomfortable to ignore your instincts, even when your brain knows it really is okay. I have gotten pretty good at telling the difference between fake fear and real fear. When I sense the sirens going off for real, I ALWAYS listen–and I have never once regretted doing so. As the firemen said, better safe than sorry. Even if I found I was being too cautious, I have always been glad I was. There’s too many things that seem inconsequential and end up being much more important than you realize. Thanks for sharing that, Kerry. Anxiety disorder certainly would muck up the issue! It was realizing I feared going to sleep that was the kicker for me. Of course I was mortified about the actual sirens and the huge lights from the fire trucks, but I don’t think you can be too careful when your home is attached to others. Interestingly enough, only one neighbor woke up and came out to see what was going on. Guess the rest are certified city sleepers! So glad all is well! It’s true you never can tell what the next moment holds. Kathryn, so glad all is well! I have a couple of similar stories, but I’ll only relate one. In January, my neighbor’s house was on fire. Six fire engines and numerous firefighters were battling the blaze. it was only inside, not outside, but when they smashed the windows upstairs to release smoke, believe me, there was black smoke. The cause of the fire? It turned out that something in the dryer seized up and sparked, burning the clothing in the dryer and spreading from there. I no longer put clothes in the washer or dryer and leave the house. My anxiety level just raised. A friend called me at 9 a.m. to tell me her sister and brother-in-law’s place in South Carolina burned, actually 108 condos in 20 buildings, yesterday. Everyone please take care and don’t let the everything comes in three’s scare come to be. And Ann, thanks for sharing your story. I’ve heard of dryer fires but am thrilled that so far I’ve never encountered one. Because I know people who have had appliance fires, we don’t run the washer, dryer, or a dishwasher when I am not home or not awake. That did not prevent an electrical problem in the wall once however, and when we called the fire company to come check it out, so they did, with lights and sirens and all that same equipment you described. It was a moment when we trusted our gut and the bad smell we were experiencing that prompted our call. I clearly remember them knocking things over as they tromped down the steps to the rec room to get to the source of the problem. But they were serious and thorough and we appreciated them. Susan, between you and Ann I guess I have to mend my ways. I am forever starting the wash or dishwasher and then running out—makes me feel like I truly am doing two things at once. Flooding was more what I’d heard about, with both appliances—not fire. Of course I guess you do have to trust that your refrigerator will behave! It started last winter, I believe it’s in the wiring and my husband can’t smell so just thinks I’m crazy. I live i n fear that he house is going to burn down. Nice hunh? The fire company told us! I have to say, I’m so glad I stumbled across your post! There was a chemical harsh scent in my house which wasn’t going away after 5 hours and I wondered what it was… Was wondering whether to call the fire department because I didn’t want to bother them but I’m glad you mentioned trusting our gut instincts, because it gave me the push to call them. In the end, it was my fridge that was causing the smell. I feel so bad that it turned out a false alarm as they came down for nothing, but also very grateful! Will 2019 be YOUR Novel Year?